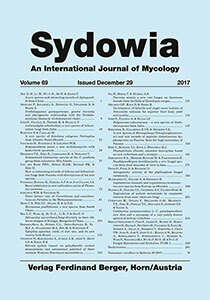 The taxonomy, phylogeny and nomenclature of Cortinarius parasuaveolens (sect. Calochroi) are treated. To date this species has been poorly known and variously and conflictingly interpreted. Based on morphological examination and analyses of DNA sequence data from the nrITS region of the type specimens of C. pseudogracilior and C. parasuaveolens (both from France), we conclude that the former is an earlier synonym of the latter. In this paper we present several collections of the species from Italy (three different sites), Hungary, Sweden and Norway, which, in combination with the two original descriptions from France, throw new light on the variation of morphological features. The macro- and micromorphological characters are compared to those of the closest related and most similar species, with a focus on C. catharinae and C. molochinus. A phylogenetic study is also provided. Keywords: Agaricomycetes, Basidiomycota, Cortinarius violaceipes, DNA ribosomal sequences, spore size and shape, taxonomy.